12-String Musings: Home Listening or Recording? We are slowly installing the acoustic treatment. The four corners are loaded with Studio Tips Corner Traps. 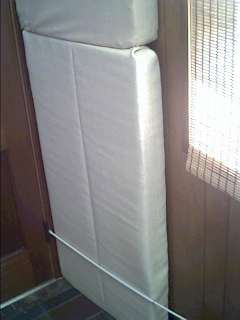 One of the ceiling traps is in place, and there are panels set up in a little 'booth' for recording. So far the change in sound for listening is remarkable, but I'm in a bit of a quandary about proceeding for recording. I'll get to that in a minute. The traps each consist of one 2 inch panel of Owens Corning 703 FRK and one 2 inch panel of 1280 Mineral Wool. The 1280 is much denser than the 703 at 8 pounds per cubic foot density. I'm not using the 1280 in the ceiling traps...too heavy. I've got two more ceiling traps to go. Last night we listened to a bit of Norah Jones, Come Away With Me. Now you can hear the bass drum clearly, and the sound of each bass note. There isn't any muddiness. Even more surprising, the last time I listened to music at any volume one could hear thumping in the rest of the house and even outside. Now it is totally silent outside the studio. 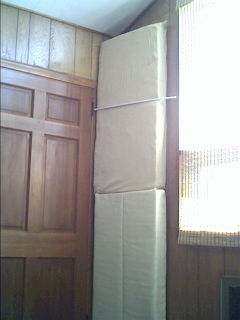 When the remaining ceiling traps are installed, I'll have 10 or more 2 inch thick acoustic panels left. I will use 3 or more of these on a brick wall, near where I plan to record. The temporary booth I set up is surrounded by mostly 1280 panels. The sound of the 12-string is certainly uncolored - very much like it sounded during my outside recording experiment. And I don't really like it. I guess a professional studio might record it dry, or uncolored, and then add electronic reverb. I could do this, or I could use most of the remaining panels to further treat the room until it had a nice sound of its own, and record within this sound.